This image was taken on January 19, 2016 at 9:27 EST in Alexandria, VA, moments before the Moon blocked the bright star Aldebaran from view. Aldebaran was occulted, or blocked from view, by the Moon for slightly more than an hour. An animation of the occultation can be seen here. 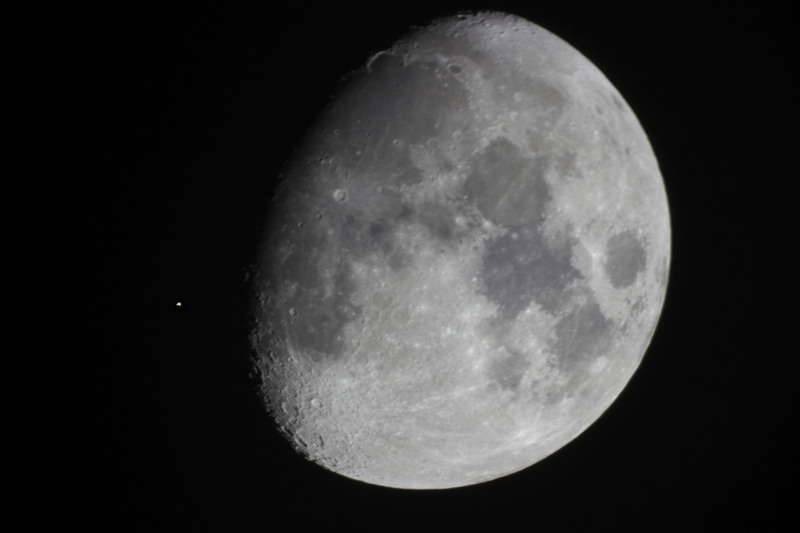 In both the image and the animation, Aldebaran was brightened relative to the Moon to make it more visible. The orange giant star was relatively easy to see next to the Moon with the naked eye or binoculars, because the eye is much better than a camera at seeing fainter and brighter objects next to each other. You can look for the next occultation of a star by the Moon by looking up your location here. Aldebaran's name on that list is "α Tau." Several places in the world will have the opportunity to see it occulted by the Moon in 2016.